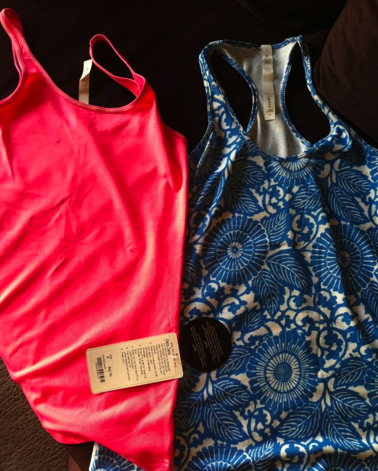 The Daily Tank on the left is Flash Dune Wee Stripe Daily, and on the right is the Porcelaine Beachy Floral Cool Racerback Tank. These were spotted in Los Angeles. I really want a tank in this print (Porcelaine Beachy Floral) but I almost lean towards wanting it in the Vitasea Every Yogi Tank instead of a CRB. Porcelaine Beachy Floral is 94% Polyester, 6% Lycra Spandex. "Store Report: Run: Play In The Sun Shorts in Dune and Concord and Run: In The Sun Shorts"